The next Hannah Poling. Not vaccine injured. No mitochondrial disease. One of the main talking points for the idea that autism is a “vaccine induced epidemic” is the case of Hannah Poling. Hannah Poling was chosen as one of the test cases for the Omnibus Autism Proceeding (OAP). But before the case went to hearing, the Department of Health and Human Services conceded her case on the grounds that she met the criteria for a table injury. If you want more details there are a lot of discussions online, including a lot of misinformation. But basically a table injury means that Miss Poling met certain criteria in a prescribed time frame after receiving vaccines, so she is presumed vaccine injured. One can go into length about how this isn’t “the vaccine court decided vaccines caused her autism”, but that’s another story (if you are interested, Prof. Dorit Reiss discusses it in Vaccine Injury Compensation and Mitochondrial Disorders). In February, I leaked news of the Federal government’s admission that vaccines had triggered autism in a little girl named Hannah Poling. The stunning revelation, though still reverberating around the world, was roundly downplayed by US officials, who insisted that Hannah had an extremely rare, genetic case of “aggravated” mitochondrial disorder, with zero bearing on other autism cases. In fact, the boy who was selected to replace Hannah Poling as the first-ever thimerosal “test case” in so-called Vaccine Court, has just been found with many of the same unusual metabolic markers as… you guessed it, Hannah Poling. You see, Hannah Poling was supposed to be a test case for the OAP. One of the arguments the families and attorneys were going to argue in the OAP was that autism is a form of mercury poisoning caused by thimerosal (which used to be in infant vaccines as a preservative.) That idea (and the Wakefield inspired MMR causes autism and bowel disease) failed to even come close to the rather lenient standard of proof of the vaccine court. No one knew for sure before the OAP hearings that the thimerosal argument would fail so completely. Those involved actually had a great deal of confidence. But even with this confidence, some families decided to leave the OAP when the Poling concession was made public. Most notably Robert Krakow (an attorney and activist in the autism-is-vaccine-injury community) pulled his son’s case from the OAP. His son was to be one of the three thimerosal test cases and is the one Mr. Kirby was discussing in his “Not Isolated, Not Rare” article quoted above. In many ways it was a strange decision on the part of Mr. Krakow. The expert report on the Krakow boy (made public as part of the OAP and since pulled) made no mention of mitochondrial dysfunction. Also, the court hadn’t decided that the idea that vaccines aggravate mitochondrial disorders causes autism. While many deny this, as an attorney Mr. Krakow must have known this point. Miss Poling was compensated because she showed signs of an encephalopathy soon after vaccination, so it was presumed that encephalopathy was caused by the vaccines. The Krakow boy’s history did not show this. In Poling v. HHS, the presiding special master clarified that the family was compensated because the Respondent conceded that the Poling child had suffered a Table Injury–not because the Respondent or the special master had concluded that any vaccination had contributed to causing or aggravating the child’s ASD. So the situation for the Krakow boy (and Hannah Poling) was very, very different than David Kirby painted (as was often true). This wasn’t another Poling case. 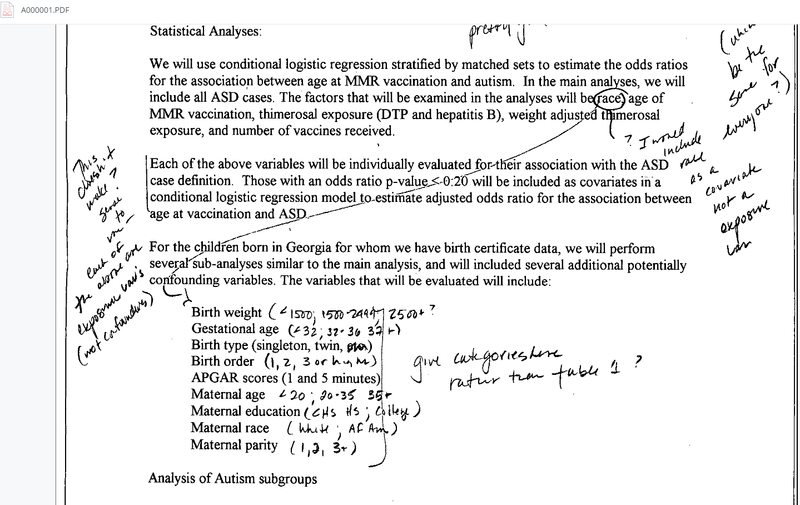 Mr. Krakow and his attorneys and experts would have to show that (a) his son had real signs of mitochondrial dysfunction, (b) the hypothesis that vaccines vaccines contribute to causing autism was valid (recall, it hadn’t been decided by hearing), (c) this hypothesis applied to his son even though his son didn’t show signs of encephalopathy following vaccination. As you will see, none of these points were valid. Mr. Krakow pulled his son’s case in 2008. The case dragged on for 7 years as the Krakows tried to put together their argument. And it appears that they did not win. Based on the facts presented, these documents appear to be the final decision and a ruling on motions in the Krakow case. These have been anonymized so it is possible that these are not a discussion of the Krakow case, but since the facts so closely match, I will write as though it is the Krakow case for brevity and clarity. The decisions are lengthy. This case is as involved–if not more–than those in the OAP itself. It’s as if this is the test case for a third OAP argument. The Krakow boy’s history is in no way similar to that of Hannah Poling. Since her case was conceded, we don’t know if she showed signs of autism before vaccination. We do know now that the Krakow boy did show signs of autism. Poling regressed. Krakow didn’t. Poling has evidence of mitochondrial disease. Krakow doesn’t. Yes. The Krakow family was following the Wakefield-recommended “separate the MMR into single vaccines” schedule. Didn’t prevent autism. This seems like valuable information for the autism community, but Mr. Krakow chose to hold this information back. The Special Master took on the general idea that vaccines trigger regression in people with mitochondrial disorders. The evidence is very much lacking and “remain speculative”. Here, petitioners’ experts strained to stretch the idea of mitochondrial regression to encompass vaccines as triggers of such regression. As described above, that extension is completely unsupported by any scientific literature; it was presented in this case almost entirely through the opinion of Dr. Kendall, supported by one case report (Poling, Res. Ex. MM, Tab 14). Doctor Kendall’s and Dr. Shafrir’s further reliance on the Shoffner and Weissman papers was misplaced and their opinions that vaccines can act as triggers of mitochondrial regression were unpersuasive. Evidence that regression in ASD, a well-described phenomenon involving the loss social communication and behavior, “looks like” mitochondrial regression was also nearly non-existent. “Mitochondrial autism” may someday be accepted as a descriptor for co-morbid autism and mitochondrial disorder diagnoses, but there is little evidence that autism itself is caused by such disorder, and no evidence that autism causes mitochondrial disorders. While Dr. Kendall is one of the few mitochondrial disorder specialists in the U.S., her opinion that vaccines can trigger either onset of a mitochondrial disorder with symptoms looking like ASD, or ASD via a mitochondrial regression are insufficiently supported and remain speculative. I [the special master] noted that the geneticist who had been seeing A.K. had specifically recommended that he continue to receive vaccinations and indicated that he was a “good candidate” to receive seasonal vaccinations, such as influenza. Many people have been trying to characterize the “vaccine court” (the Court of Federal Claims) as highly adversarial. But Mr. Krakow writes that “The tenor of VICP proceedings is exceptionally hostile and adversarial”. The record show the Court was far from hostile and adversarial. Other than the filing of medical records, petitioners did little to advance their claim during the period in which [A.K.’s father] was attorney of record. However, the glacial pace of progress toward a causation hearing continued for many months thereafter. Mr. McHugh’s representation has been marked with missed deadlines, repeated requests for delays, late filings, and difficulties in properly designating and filing exhibits. His failure to meet deadlines nearly cost petitioners the opportunity to fully litigate their son’s claim. Accordingly, after petitioners missed the deadlines set forth in my August 18, 2010 order, I ordered them to show cause why their case should not be dismissed for failure to prosecute and comply with court orders. See Order to Show Cause, issued Sept. 3, 2010 (ECF No. 98). After petitioners ignored the deadline in the show cause order, I dismissed their petition on October 13, 2010. The Court allowed the family to petition and re-enter the vaccine program. Not only that, but the Court granted the motion to redact parts of the dismissal. The dismissal was available on the vaccine court website (where I found and read it) but was pulled. Many in the “autism is a vaccine epidemic” community call for a repeal of the vaccine act and a return to the time when vaccine manufacturers could sued directly. How many cases in regular court are dismissed and allowed back in? We could go on as the decisions are lengthy but instead let’s get back to the key points above. When David Kirby wrote his article he concluded “And there are many more Hannah’s out there, waiting to be counted.” Just not so. First off, the real Hannah Poling case isn’t what Kirby claimed. The Court has stated that neither they nor the government “…concluded that any vaccination had contributed to causing or aggravating the child’s ASD.” More importantly, this new case isn’t about a child with mitochondrial disorder, or even regression. It is a case of a child who showed signs of autism before the vaccines the parents claim caused autism. This is a case of one of the most vocal proponents of the idea that vaccines cause autism misleading the public. Mr. Krakow probably believes the story he tells of his child’s development. He probably believes the story about how contentious the vaccine court is. But the facts tell a very different story. I am often asked why I can not support the idea that vaccines cause autism. Thousands of parents tell the same story, I’m told. The problem is that the parents stories don’t match the facts. We saw this with Jenny McCarthy. We saw this with the Omnibus Autism Proceeding test cases. We’ve seen this with more vaccine court cases. We’ve seen this with parent stories shifting in online discussions. And now we’ve seen this with “the next Hannah Poling”. I’ll keep this simple and direct: the FDA has proposed a new rule: Banned Devices; Proposal to Ban Electrical Stimulation Devices Used to Treat Self-Injurious or Aggressive Behavior. SUMMARY: The Food and Drug Administration (FDA or we) is proposing to ban electrical stimulation devices used to treat aggressive or self-injurious behavior. FDA has determined that these devices present an unreasonable and substantial risk of illness or injury that cannot be corrected or eliminated by labeling. FDA is proposing to include in this ban both new devices and devices already in distribution and use. We are aware of only one manufacturer, JRC, that has recently manufactured ESDs and that currently uses ESDs, including devices that we have not previously cleared. JRC is the Judge Rotenberg Center, a residential school in Massachusetts for disabled students, many of whom are autistic. The JRC uses the ESD’s (electrical stimulation devices) as punishments to try to control behavior for some of their students. According to the document, the JRC used their devices (called GED at the school) on 82 individuals in 2014. In addition to NASDDDS and a JRC parents group, referenced earlier, 15 other organizations concerned with the treatment and the rights of individuals with disabilities spoke at the Panel Meeting, all of which supported a ban. Twenty-two disability rights organizations submitted written comments to the Panel Meeting docket, one of which was signed by 23 disability rights groups. Nine of these organizations were among the 15 represented at the Panel Meeting. All of these comments support the ban. FDA also received a comment from the U.S. Department of Justice Civil Rights Division supportive of a ban, and we considered information from the National Council on Disability, the National Institutes of Health, and the United Nations Special Rapporteur on Torture. The FDA is not just relying upon community input. They also note the scientific literature which shows significant risks of PTSD and anxiety and other adverse events following the use of shock devices. Here is a survivor’s letter, an account from a former JRC student who was subjected to the shocks. The JRC was in the news after a student was tied to a board for 7 hours and shocked 31 times. The original news story links are no longer valid, but I will try to find them and link to them here. The shock devices just do not have a sound backing–scientifically or ethically. If this FDA rule goes into place, the days when disabled students in America can be subjected to electric shocks like these will come to an end. One thing I have noticed over the years–those who are antagonistic towards vaccines are quite willing to use the disability community, but are rarely willing to offer us respect. Consider Andrew Wakefield, who introduced one book with a fictionalized account of a mother murdering her autistic child. He framed it as an act of love by the mother. Or his film, “who killed Alex Spourdalakis”. Alex was an autistic young man with extraordinary needs. Andrew Wakefield tried to make Alex’s life into an episode for his (now failed) reality TV show. When Alex was brutally murdered by his mother and another caregiver, Wakefield took his footage and made a film. It was an apology piece for the murders, using Alex as a hammer to attack mainstream medicine. My child is not a blight. On me, my family or on anyone else. My child is not blighted. My life is better for my child. Challenges, struggles and all. Just to be clear Ms. Hightower: if you didn’t respond to Mr. Wakefield in a way similar to the above, shame on you. But, while I am at it, shame on you for promoting this man and his damaging message. If you believe him, take a moment and ask yourself: if he’s lying (he is) how much harm has he caused to me, my family and mostly my son? When you dehumanize people Mr. Wakefield, you make it easier for people to murder my child. You made it easier for people to abuse my child. You make it easier for people to disrespect my child. It is already a struggle to get adequate supports and assistance. How much will people be willing to help the “blighted”? My child doesn’t need the charity of pity. My child needs the helping hand of respect. And you, Mr. Wakefield, are in the way of that. People ask me why do I spend my time countering your misinformation. This is why.